Most books on hematopathology are neoplastic in scope and offer little non-neoplastic content. 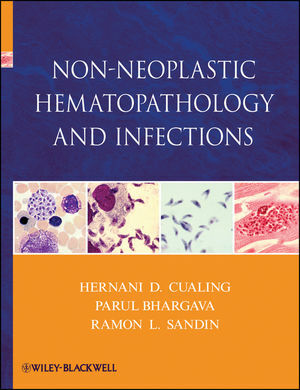 In Non-Neoplastic Hematopathology and Infections, the authors fully describe the hematologic manifestations in tissue and blood of infectious agents, including many rare and exotic diseases found in both Western and Eastern hemispheres, in order to assist pathologists and medical laboratory professionals all over the world in better diagnosing and treating such infections. Thoroughly illustrated with photographs, tables and text, this book features a wide range of non-neoplastic hematologic disorders, as well as reactive patterns of non-infectious and infectious agents. Comprehensive and state-of-the-art diagnostic materials are described, as are the epidemiology, pathobiology, clinical and pathologic manifestations in blood and lymphatic organs—as well as the approaches to treatment. Non-Neoplastic Hematopathology and Infections is an important book for any medical professional interested in non-neoplastic hematology, infections and tissue hematopathology, infectious diseases and tropical medicine, and tropical hematopathology. Hernani Cualing MD, is Associate Professor in the Department of Pathology and Cell Biology and Director of the Hematopathology Fellowship Training Program at the University of South Florida College of Medicine in Tampa, Florida. He is also an active hematopathologist at the Moffitt Cancer Center and Research Institute there. In addition to his research into such topics as mantle cell and T cell lymphomas, Dr. Cualing has long been fascinated with the analysis, diagnosis, and treatment of non-neoplastic and infectious blood, marrow, and lymph diseases. Parul Bhargava, MD, is Medical Director in the Hematology Laboratory at Beth Israel Deaconess Medical Center-Needham Campus in Boston, and a staff and faculty physician in the Pathology department there. Her primary research interests are in studying hematopoietic neoplasms and newer markers in Hodgkin Lymphoma, but she also has a strong, separate clinical interest in studying the effects of immunodeficiency and infections, particularly HIV, on the hematopoietic system. Ramon L. Sandin, MD, MS, FCAP, ABP-MM, is a Clinical Pathologist and Medical Director of Clinical Microbiology and Virology in the Department of Hematopathology, Laboratory Medicine, and in the Blood and Marrow Transplant Program at the Moffitt Cancer Center in Tampa, Florida 33612-9497. His special areas of expertise and research interests are in clinical microbiology and virology, and laboratory diagnosis of infectious diseases. This includes 'wet' laboratory work-ups and tissue section diagnosis as well as molecular diagnostic techniques.